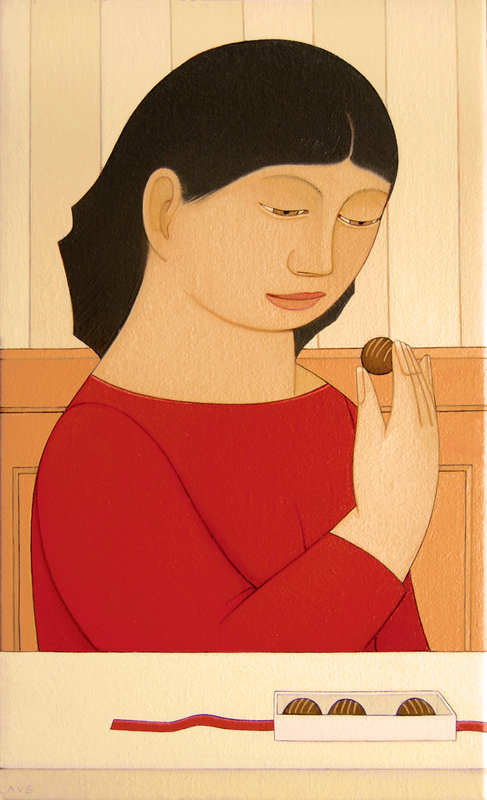 One of my favorite contemporary American painters, Andrew Stevovich, recently posted this new painting, “Chocolate Truffles,” on his blog http://andrewstevovich.blogspot.com . I like it on so many different levels. With Stevovich’s work, I always feel to some degree like it’s a Rorschach test for what is going on inside my head, inside the head of any viewer of his work, rather than what is going on inside the artist’s head. I’m in awe of how Stevovich manages to remain removed from, yet completely present in his inimitable style in, his own work. Trying to figure out what his intentions are always fascinates me. Not only is he a remarkably gifted painter, in terms of process and color, but he’s also an extremely keen visual commentator on the human condition. About this work, Stevovich writes, “As in the first version, I kept to an analogous harmony of closely related colors. Often when I go in this direction, I’ll add a note of complementary color which can add some jump and energy to the visual experience – perhaps could have made the ribbon green or blue – but this painting wanted the quiet of staying totally focused on warmth.” So, he keeps his focus, and ours, entirely on the process by which he paints and makes color choices. Yet, for me, the beauty of his process is just the entry to the profound world that he creates. For me, here in this world, a woman is plagued by a simple choice: truffle or no? But for women, food is never an easy choice. For women, food is friend or foe. As she pauses with the truffle, I wonder if she’s worried about breaking her diet? Or perhaps she’s paused to contemplate the beau who gave her the box as a gift? What does the truffle represent? What is this woman thinking? Why did Stevovich choose this as subject matter? What made him think of this, or other things he’s represented in his work, such as hats and subways and card players. So, here are all the “layers” I just spoke of. The work just keeps unfolding and revealing itself to me. However, my reveal – my response to this woman staring at a chocolate truffle – may be entirely different than yours. How does Stevovich always make this mundane world his subjects inhabit seem so chillingly intriguing? How does he make this world so enticing, dangerous and beautiful at the same time? It’s simple. He’s brilliant. He’s one of the most brilliant painters working today and I’m so glad to have found his work through my friend, Wendy Blazier, who brought his show to the Boca Raton Museum of Art a few years back. Always a pleasure to read your postings and be introduced to someone through your eyes. I’m sorry that I won’t be able to come to the Norton on Thursday – going to a lecture at the Armory instead – always too many good choices. I am going to be spending a lot of time at Art Palm Beach. Let me know if you’d like to join me for some of it, or when you are going. It would be nice to spend some time together. There are lectures I’d like to attend every day, though I may take a break and miss some. And hope to see you tonight in Fort Lauderdale. I wonder if she’s worried about breaking her diet? Or perhaps she’s paused to contemplate the beau who gave her the box as a gift? NO NO !! It is ONE BITE OR TWO?